Here on this page You will find important business contracts for the trading market between the Institution ID's GSCPC and the Federal Government. The contracts serve for the strategic and peaceful development of the Institution and the development of an international trading and security partnership site which, for ourselves, has more important positions and, therefore, strategic opportunities for joint development. Please, You can Activate some of our contracts or You can have Your own market idea under ID's GSCPC of Private Companies. Thank You and wish You pleasant days! Contract Business designed be The King, You can join our business ! Unlimited capacity of Peacekeeping Services be the Contract N.°: 03, and agreement on our International trade as profit of Institution. 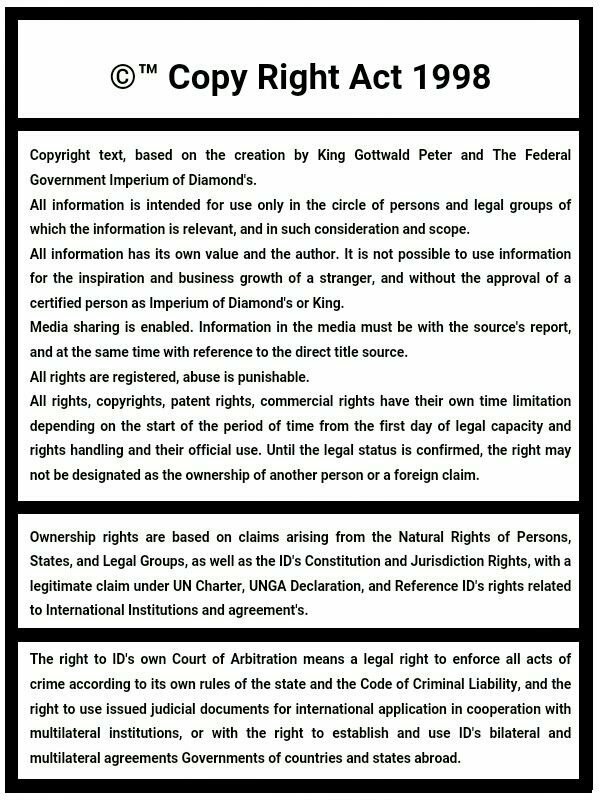 Global Contract on Prisoner's, goal for administration of 10,000,000 prisoner's, Colonial Work, Military or Security, and other special mission's. Global cooperation with Independent & Separatist people in interest of their peace stabilization and centralization into the ID's Federal territories. 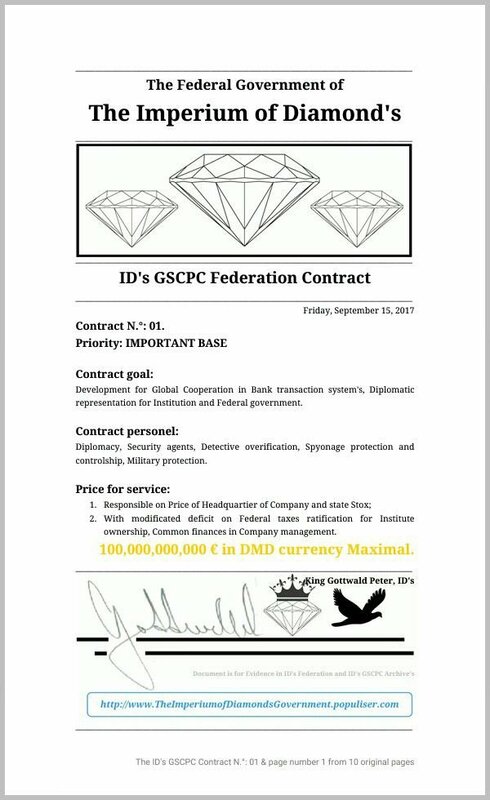 Global Contract on cooperation for oportunity of Diplomatical development between Noble families and people, most Money people in the world, most active business companies and most money Banks worldwide, and protect Federal development with an oportunity for Institutional development of Corporate site. The Contract in legal norm confirm right for registration of Institutional Development Value at 50-100,000,000,000,000 €€, power of World economy. Global Contract on counter cooperation for development new space civilization in International governmental property and jurisdiction, The Alliance states. Opportunity for Global Governmental cooperation and special industrial development, manipulation with special technologies and colonize new galaxies. Financial budget for the mission is limited according taxes and registered activities, 10,000,000,000 € value on company standart, also opportunity for new limitation in the project finish. The Member of Institution have a right for cooperative development on New Corporate Infrastructure of Automatized factories for production of Android's, Industrial Machines, Heavy Technologies, and industries for colonization of new planet's. Application is need only to join GSCPC Office with the Business Administration employment and get the successful profit's from Business development, also opportunity for Your own active development of the Protective Mission's of Company. The Member of Institution GSCPC, or The Administration of Business operate in the goal of Corporate development. Diplomacy, business model primary planing, direction of development, strategical building and recruitment of business institution's or use own corporate network's and state firm's. Recruitment of foreign companies can be available by the Business Companies for service of Administration Business, Companies for Business Promotion and Recruitment, Companies for Business Organizing and Development, Companies for Employment, Companies for Business Design and Growth, also the State Business Association's and State Policies, Consulates of States. Development of Active Trial Investigation Commission for guarantee on responsible use and verification on legal affair's. Trial Security Commission is activate from Security Service of Member Companies, and Police of State active under jurisdiction of state. Open The Office of Institution, and The Department of Business Administration. Employ new Business Administrative Personal or use actual Business Board, contract Legal Companies or Firm's for Business Management Service Administration. The goal of organization is develop infrastructure of trade and business growth by the firm's and companies active in organized coordination under pre-agreement on financial payment from the success of business sale after factorization process under contract between all companies. The Business infrastructure is develop by strategical Recruit of the private firms and consolidate firms in development strategy according the modular business model by primary, secondary and terciary sectors of economy in one consolidation. Physical business firm's, Legal Business Companies. Physical Firm's in strategical consolidation can have equal statistical production as a modern factory, and also consolidated physical firms can use their cooperation for establishment of new Modern Factory in ID's territories (Land, Underwater, Free space, another planet's), according the profit's from organized contract between all firm's in the Consolidation on one site trade. Primary sector: Raw Mining, Laboratory source production, agronomy plantation's of raw sources, Indoor Agro-growth, renewable sources, re-cyclation industries, the companies for all kind's available for production of raw material's and sources. Local site of Primary sector is geological service, chemical test's of raw sources, the storage of raw material's, material controlship and identification. First category, Raw source factorization, gross raw source transformation on the pure material's (Metal Ore->Steel). The Companies of Petro Oil Industries, Oil Rafineries, Metalurgy Factories, Gass production and storage, process of raw material purification and storage in the form's under industrial norms, transportation norms, security norms and economic norms. Second category, source component factorization and construction of first product. The Electro procesors, component's of technologies, part's of the building technology. Third category, product's construction into the one technology. Construction of ships, aircrafts, technologies in the finish process on building. Terciary sector: Service of sale managent and organized trade cyclation stabilize, organizing of organized sale event's, architecture design, virtual program planing and development, technology engineering, business administration, security controlship, protection. Payment for all service is provided by a money from a bank under the strategy of the business increasment and currency growth in the process of valuable registration, or under development economy in inter-institution trade as a contract of organized trade, source change or internal investment coordination. Exchange Stox system of Business is also available, Corporate Infrastructure of firm's with own right on internal trade administration and strategical process of investment, payment by the share paper's registered in the office under flexible capital fund's, available for International exchange between companies, financial institution's and bank's. The goal of business companies is development Institutional own Business infrastructure by use of the increasment from the first business infrastructure, and strategically use for the development of automatized business companies for industrial activities, autonomy production of robotic's, weapon's, military heavy technologies, space ship's, also industrial machines and generator's, mining technologies. Process of Company development: Consolidation of New Firm's. Laboratory production of metal's, Metal ore mining, source separation. Companies produce the material of the Raw sources. The Raw Source is distributed to the Electro technic engineer, Metalurgy firm's, Construction of Robotic's, and electro procesor's factory production, design of Digital Program's for Computer Automatization of Industries. Companies use material and source for development of Robotic Technologies, Industrial Robot's, Robotic Arm's, Industrial Machines and Generator's. The Technologies of Industrial Sector is distributed for a New Company of Institution. New Company of Institution produce own Technologies for Industrial proceses and development, also Mining and Laboratory technologies. Technologies from New Institutional Company is use for open Business sale, or Exchange for new material's and source need's for strategical development, also for new strategical building of the Corporate infrastructure. New Companies of Institution have a right stabile connect market with first site of partner trade companies, and also strength the trade of cooperative business. Profit in Finance or profit in the Source of Technologies is use in payment for all companies which accept cooperation on business centralization and organized trade in first trade action. Primary interest of new Institutional companies, is develop own infrastructure of raw sources mining and laboratories for raw source production by the chemical practices. Land Mines, International Waters under sea mines, sea purification centers, Space Mines in Meteor's and new Planet's. Secondary interest of new Institutional companies, is develop factory infrastructure, first category of multi industry for strategical modernization of whole corporate site of Institution, and also capacity multiplication. Multi industry is also developed for metalurgy, chemistry, construction, technologies, meanly computer's, electronic's and the robotic's, also weapon's and heavy military materials, space ships, transports, also building new factories and halls undersea, underground, land, free-space industrial stations and industrial infrastructure on another planets. The Technological Factory Infrastructure is use for stabile International profit's and trade cooperation between alliance partner companies and corporation's for business, states and governments or specialized institutions. The financial system between Institutional Companies is based only on source administration, companies is automatized, institution needn't pay for material, and institution have available opportunity for repair of industrial technologies by a production of new machines, or use robotic android's for service of technological reparation. Source of raw materials is unlimeted by a development of mine center's from renewable sources or the raw centers of mines in universe or laboratory autonomy production. All sources of Technologies is open for use in the need's of Institution and their member's, according the Central Code of Institution.